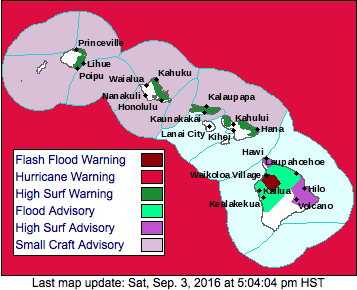 The National Weather Service in Honolulu has issued a Flash Flood Warning for Hawaii Island until 8 p.m.
At 4:52 p.m. weather radar and rain gages indicated that heavy rain is persisting over the slopes in the South Kohala and North Kona districts. Gulches crossing Mamalahoa Highway (Route 190) between Puuanahulu and Waimea were at risk of overflowing. Some of these gulches also flow near Waikoloa Village and into Puako. Rainfall may continue for several more hours. Locations in the warning include, but are not limited to, Waikoloa Village, Puako, Puuanahulu, Pohakuloa Training Area, Pohakuloa Camp, Waikii, Mauna Lani and Waikoloa Beach. This warning may be extended should heavy rains continue.